THE hardest part about having diabetes is having to prick her finger about 10 times a day to check her blood sugar level, says Natasha Nohelani Garcia. "The other hard part is I don't get to enjoy eating the stuff I want to," added Natasha, 12. 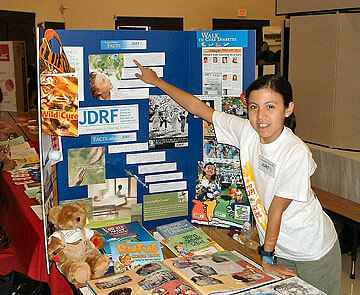 The daughter of Leonardo Garcia and Sandra Dubrett of Pearl City, Natasha has type 1 insulin-dependent diabetes. She was chosen to represent Hawaii on Capitol Hill at the Juvenile Diabetes Research Foundation's Children's Congress from June 17 to 20. About 150 type 1 diabetic children ages 4 to 17, representing all states and the District of Columbia, will visit lawmakers to urge support for research to find a cure. Type 1 diabetes, when a person's pancreas stops producing insulin needed to get energy from food, accounts for about $132 billion in health care costs annually in the United States, according to the JDRF. Natasha was diagnosed in May 2001 and was immediately contacted by the foundation, which provided a "bag of hope," her father said. The gift included a training aid on how to test blood and give insulin injections and a videotape about living with diabetes, he said. Natasha said she will tell lawmakers her personal story "and why a cure for juvenile diabetes is important for me." If a cure isn't found, she says in a letter to congressional members, "I could suffer from the complications associated with the disease later in my life. Complications I don't like to think about." Natasha said her teachers and classmates understand what she's going through and help her. And diabetes doesn't hold her back, she said. "I dance hula and Tahitian as hobbies." She has worn an insulin pump for two years. She said she's hoping for "better equipment to help the pump, to make it more easier." Her message for others living with the disease is: "Take care of themselves, check their blood and watch their diet." Since Natasha must depend on insulin all of her life, Garcia said he and his daughter got involved with the JDRF's Hawaii Chapter as volunteers. They wear "Walk to Cure Diabetes" T-shirts as often as possible and work to increase awareness of the disease and the importance of research to find a cure. In 2005, Natasha, her father and other advocates worked to introduce legislation to establish a safety net for type 1 diabetic children in the school system. Natasha lobbied and testified at hearings and was presented with the first signed copy when Gov. Linda Lingle signed the bill into law. The law allows volunteers at schools to be trained by medical professionals to give injections for low blood sugar that could result in loss of consciousness or a seizure. Natasha's new goal is to gain passage of a bill that failed in the last session to establish a Juvenile Diabetes Research Care Fund, allowing residents to donate money for it on their state income tax return. » Will the real China please stand up?